The Electrical System in Your Home. Common Problems Found by a Home Inspector. Part 1 in a Multi Part Series. Service Entrance and Your Main Service Panel. About the author. I am a NJ Licensed Home Inspector. I am the owner and Senior Inspector at Regal Home Inspections, LLC. I am a member of the New Jersey Association of Licensed Professional Home Inspectors (NJ-ALPHI) and the National Association of Certified Home Inspectors (NACHI). The standards used to inspect your home’s systems are in accordance with New Jersey State laws, the American Society of Home Inspectors (ASHI) and NACHI Standards of Practice. Regal Home Inspections, LLC can also test your house for Indoor Air Quality; Mold and Allergens. Radon testing is coming soon. We can also facilitate testing of septic systems and oil tanks; tank integrity and soil tests below ground. If you’d like a visual inspection of your home’s electrical system because you think there might be problems with it, please call Regal Home Inspections, LLC and we can perform a limited, visual electrical inspection of your system in accordance with the ASHI & NACHI Standards of Practice. This is not a “to code” inspection. Our inspection DOES NOT guarantee conformance to local electrical codes. Electricity is something that we all use and likely, all take for granted. I know I have up until the time that the power to my home goes out as it did during Super Storm Sandy. The electrical system in your home is, like many other systems in your home, critical to its proper operation and critical to our comfort. It is also crucial to our safety as electrical problems can be fatal. They can be fatal because they can electrocute someone and they can be fatal because they can be the cause of a fire which is equally dangerous. Properly designed, built and maintained the electrical system in your home should be as safe as any other aspect of your home but a poorly built or maintained electrical system is a safety issue. As I completed an inspection recently I was motivated to write this piece for two reasons. First, the number of electrical problems were many and the second reason is that rarely do I do an inspection and not find electrical problems. Furthermore, the types of electrical issues found on home inspections often rise to the level of significant, “Safety” problems. This means, they are potentially serious accidents waiting to happen as a result. Finally, they are either because of homeowner performing their own electrical work, which may be illegal, or because the home is old and the owners over time never upgraded the electrical system. Now we are applying current day analysis to a semi-obsolete electrical system resulting in a number of problems identified as problems and often, “Safety” issues. When I prepare a report “Major Defects” and “Safety” issues are highlighted within the report as well as the sole subject of my report’s Summary. The report, of course, includes many other informative aspects but these two are of particular interest (to lawyers and buyers) and of concern to both as well. It has been requested of me by lawyers, that recommend me to clients, that they like to see a Summary of the “Major Defects” and “Safety” issues. A lawyer isn’t as concerned about maintenance issues and a dripping faucet for example. They want to go to the areas that might impact the occupancy, safety and value for example. This is understandable in my opinion. The electrical system is a significant aspect of the inspection. All areas are important but the electrical system is rather extensive. It begins with the service entrance. This is the cable that brings electricity into the home. It’s often through overhead cables but many newer homes have service that comes to the home through underground cables. This is known as a “Service Lateral”. The overhead wires are known as “Service Drop”. Let’s look at the rest of this piece assuming a Service Drop type of installation. The wires come from a utility pole and not too far away is a transformer. Please note that much of these explanations are simplifications. To provide all the detail is too exhaustive for this piece. 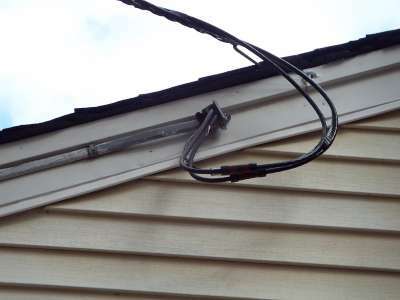 The first thing an inspector will look at is the height of the cable at its lowest point and its proximity to the roof, metal gutters and windows as it arrives at the mast or conduit at the side of the home. Some homes have SE Cable and not a conduit. “SE” stands for Service Entrance. The cables (you will usually see 3 distinct wires) should have a loop in them very close to the side of the house. This loop is called a drip loop and prevents water from running along the wire and into the conduit. This loop also facilitates the splices between what is the utility’s wire (from the pole) and the start of the electrical system owned by and the responsibility of the home owner. In Photo 1 you can see the loop and while it’s hard to see, there are three cables. The wider sections at the bottom of the loop are the splices. In this photo, to the right of the photo is the utility’s cable (responsibility) and to the left (and in to the home) is the owner’s responsibility. Where the loop goes into the SE cable (straight gray cable going down to the left) is a weather head or seal so water does not enter the cable. Typically, homes have three wires as this one does. One is the neutral, one is 120V AC and the other is also 120V AC. This home would therefore have electrical service referred to as “120/240”. In Photo 2, please notice that the weather head does not exist. 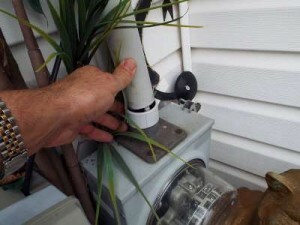 Water from rain can enter the conduit and once in the conduit the next stop is inside the electric meter panel. Water and electricity are not a good combination when safety is the goal. This is also 3 wires so it is 120/240 service. As you probably know, the wires go through the electric meter. The electric meter measures the amount of electricity you use. The meter should be safe from damage and secure. Please notice how the conduit for this electric meter (Photo 3) is not secure in the manner it should be. A curious child might try to stick something in the gap because that’s what kids do. Additionally this meter is ankle high at the top of the stoop by the front door. The entire electric meter box is also loose. From the weather head to the meter must be serviced by a licensed electrician! Coming out of the other side of the electric meter, the cables should quickly (in the shortest path possible) go into the house’s electrical Service Panel (aka Circuit Breaker Box or Panel) – Photo 4. 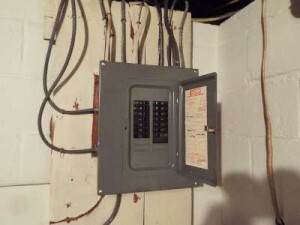 Circuit breaker panels are typically located in a garage or basement. They may also be located in an interior wall in a hall for example. But they should not be located in a closet or bathroom. In most homes there is one Service Panel. A Circuit Breaker is an “over current protector”. Current in this situation means amperage, amperes or amps. Amps refers to the amount of electrical energy and as little as a fraction of an amp can kill. If your house has fuses and a fuse-panel, you should consult a licensed electrician and plan to have the fuse panel replaced with a modern circuit breaker panel. Your main panel is rated for a particular amperage (amperage rating) and is usually 200 amps. While the panel is “rated” for 200 amps your main disconnect at the top of your panel may be 100, 150 or 200 amps. Below the main breaker are the individual circuit breakers. This photo is of a modern panel with the door closed. This panel is clean and secure. What are some of the issues with panels? There are many issues that I have encountered. They almost always are documented in the report as Safety issues and have the potential of causing problems at the time of closing. Why is that the case? The seller says the house is for sale, “As is”. The inspector highlights the problem as Safety related or a Major Defect and the issue has the potential to spoil a deal. Lesson: If you are planning to sell your house, spend a few hundred dollars and have it inspected. Then fix the problems the inspector finds. In Photo 5, notice that there isn’t a main disconnect. For safety reasons, if more than Six (6) switches are needed to disconnect power in a home, a single, main disconnect is required. Notice that this panel has 14 circuit breakers but does not have a single, main disconnect. It was highlighted in the home inspection report as a Safety issue. Other issues with panels include missing and/or incorrect screws that attach the panel cover to the panel base. Why are these important? If the cover is removed or can easily be dislodged because the appropriate screws aren’t used or are missing, the exposed metallic components (wires, bus bar and terminals) are dangerous. As you will probably agree, most screws have a point at the end, right? The screws used to attach the cover to the base DO NOT have points. The points could pierce the insulation of the hot/live wires inside the box again creating a safety issue. Only the screws provided by the panel’s manufacturer should be used. DO NOT grab the handiest wood screw and use it to secure the cover. You could electrocute yourself. Call a licensed electrician! 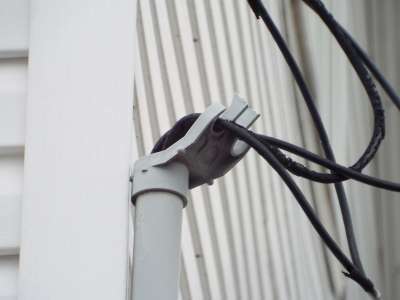 Frequently seen (or not seen) in panels are missing bushings where the cable enters the metal box, knock outs that were never used for cable entrances as well as for circuit breakers. 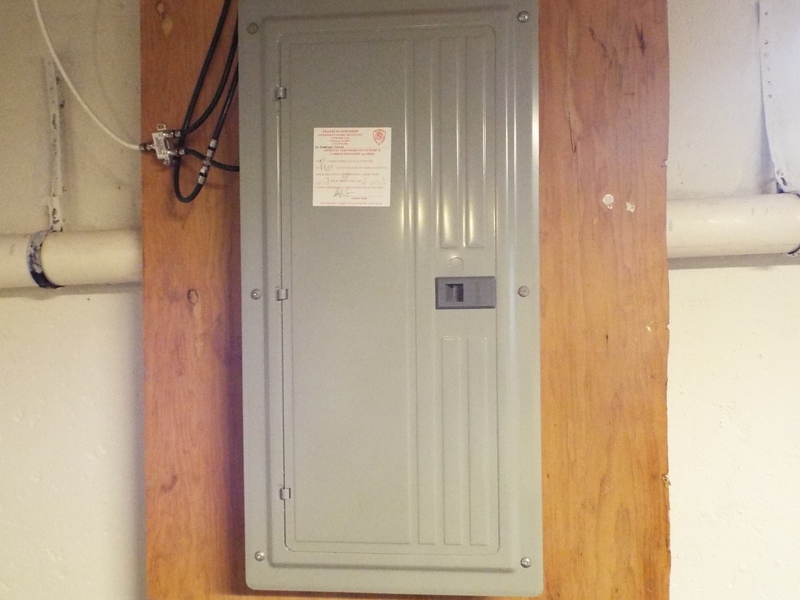 Although this panel cover (Photo 6) was removed for inspection, please notice the bushings that secure the orange cables to the side of the box. Then look a little lower to the white cable. Notice that there isn’t a bushing. The soft cable jacket and the wire’s insulation can be cut or nicked by the sharp edge where the cable enters the box. That isn’t the only issue with this box. Bushings are missing elsewhere, there weren’t four screws securing the cover and NONE of the screws used were correct. If you look on the left side of the face, where the screw holes are, you’ll see a small brown dot. That’s the hole where the screw goes. Now notice the cable right behind where the screw goes in. This is a safety hazard. Because of this, and other wiring issues, analysis and correction by a licensed electrician was emphatically encouraged. Among many other things that an inspector should look for includes “double taps”, bare wire ends inside the box, proper use of the correct wire gauge for the capacity of the circuit breaker and many other aspects that could compromise safety. In some homes there are also “Sub Panels”. Sub panels concentrate some circuit breakers for a specific reason. If you add a pool for example, a sub panel might be used. If you have a panel that can house 24 (as an example) circuit breakers and you do an expansion and need 10 more, a sub panel may be added to increase circuit breaker capacity. 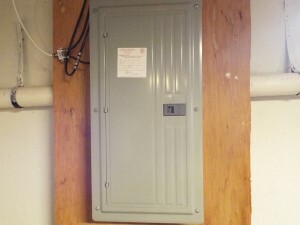 The inspection of a sub panel is similar to the inspection of the main panel. There are differences however. 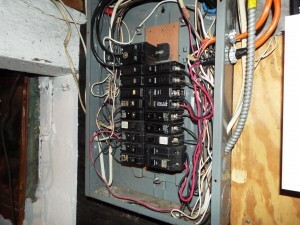 Your inspector should spend a good deal of time inspecting the service panel. If you are planning to sell, hoping to buy or planning to stay in your home for a while, call Regal Home Inspections, LLC for an inspection of your electrical system in accordance with ASHI and NACHI Standards of Practice. The next article in the electrical series will cover the Branch Circuit Wiring. This includes the wiring FROM the circuit breaker box to your outlets and switches. What is the inspector looking for?